After incorporating several new encapsulation, liquid capsule, and capsule-in-capsule machines to their manufacturing capabilities, Ion Labs has their sights set on being the #1 contract manufacturer of liquid capsules in the world in 2018. Liquid Capsule machines are going to become the future of our business, because many companies are looking for innovation, and that is going to be a big part of the future innovation. Ions Labs, the leading contract manufacturer of dietary supplements, pet supplements, skin care products and OTC drugs produced and sold in the U.S., is perfectly positioned to answer the call for new innovative technology in the nutritional products community. Ion Lab’s Capsule-in-Capsule technology and time released delivery system is at the forefront of capsule innovation. Their Capsule-in-Capsule design encompasses a 2-step delivery process. The outer capsule is absorbed in the earlier stages of digestion and intestinal tract, revealing an inner capsule. The inner capsule then releases a secondary set of ingredients further down the digestive tract. This process maximizes nutrient and ingredient absorption for an overall more potent product. “Liquid Capsule machines are going to become the future of our business, because many companies are looking for innovation, and that is going to be a big part of the future innovation.” Ivan IIchev, VP of Operations at Ion Labs, tells us. Many may not realize the many benefits of a capsule over a tablet or other supplement forms. A capsule is generally easier for consumers to swallow as it’s outer coating is composed of gelatin or vegetable cellulose. This is also what makes the capsule dissolve more quickly in the digestive tract, encouraging better and faster absorption. The capsule coating is more effective at hiding the unpleasant odors of strong smelling ingredients than other supplement forms. In addition, liquid capsules are superior in offering faster nutrient delivery and absorption, and in handling a wider range of ingredients, as they can endure higher temperatures during the filling process. 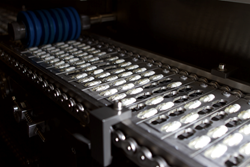 Ion Lab’s FDA-registered, cGMP-certified facility can produce as many as 1.5 million liquid capsules a day. They are able to meet the high demand for quantity and quality. They earn their cGMP certification through a vigilant attention to quality control and through the work of their in-house research and development team. Their technology also provides individual capsule customization for a personal branding touch. From varying shell colors, sizes, logo and text applications, businesses can uniquely brand and identify their very own capsule-in-capsule product line. Ion Labs, Inc. is a contract manufacturer that has been providing new and existing clients with the highest quality products in nutrition and health manufacturing since 1983. From product development to contract manufacturing to release and shipping, adherence to cGMP compliance in an FDA-registered facility has been our formula for integrity and product fulfillment for over thirty years. Ion Labs specializes in manufacturing dietary supplements, OTCs, pet supplements, and skin care products in the United States of America.